A few years ago, I decided to find a way of making money which would, at the same time, enable me to draw on my passion for squash. 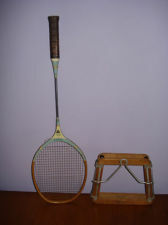 A well-connected friend of mine suggested that I invest in vintage squash racquets. They must be authentic, he told me, or you’ll waste your investment. The problem was, how could I learn to distinguish high value racquets from the inferior article? I decided to find the acclaimed expert in the field. Everybody I asked mentioned the same highly regarded teacher and so I sought him out. I managed to get hold of his number and rang him at his home. It seemed a high price to pay, but he was reputed to be the world expert and I presumed that I’d learn a great deal in those five days. So, I agreed the contract and sent him a letter to that effect. He told me to visit his house each day between 9 and 11 a.m. starting the following Monday. Two hours a day seemed a little on the short side for such an expensive training, but I duly turned up and was greeted by a tall, elderly man with white hair wearing a tracksuit. He ushered me into a sparsely-furnished room containing a long, wooden table. In the middle of the table, mounted by its handle on a plinth was a wood-framed squash racquet with what I assumed were gut strings. Placed on either side of the table were two chairs. The Master sat on one side and I was invited to sit on the other. ‘Look at the racquet,’ he commanded and fixed his attention on it. I felt that I’d been short-changed on this first lesson, but was sure that tomorrow he’d tell me what I should have noticed. The next day, at the same time, in the same room, I found myself sitting opposite another racquet. ‘Look at the racquet,’ the Master once again commanded. My study was intermingled with my growing eagerness and anticipation of what I was going to be told. But not a word came from the Master’s lips until I was once again told that it was the end of the lesson and he would see me tomorrow. The third day turned out to be the same as the first two. I rationalised my growing fury by telling myself that, this being the acclaimed expert, he was waiting for me to have studied several different racquets before giving me a lecture on how they all differed. Surely, in the rest of the week, he would tell me how the colour of the markings on the racquets differed, how to distinguish the fine-grained textures of the wood used for the head and the handle, the shape and symmetry of the frame and so on. However, the fourth day came and went exactly as the others had done before them. Another racquet and an hour’s silent study. I arrived at the last lesson on the Friday morning, keyed up with anticipation. Now all was going to be revealed and I was sure that I was going to have really concentrate to get my £5000-worth of learning into my head in this one short hour. This kind of teaching story is found in the Zen Buddhist tradition. It’s based on the story ‘Learning from the Experts’ taken from ‘The Wise Fool’s Guide to Leadership’ by Peter Hawkins. 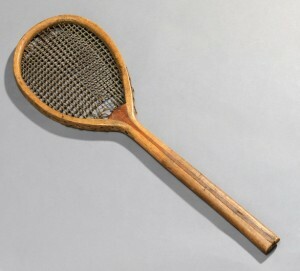 This entry was posted in Squash and Culture, Squash and the Arts, Squash Rackets and tagged Psychologist, Role Model, squash racket, wooden squash racket by Peter Heywood. Bookmark the permalink.